With a surface temperature hot enough to melt lead, Venus would not seem to be a candidate for manned exploration, but NASA seems to think otherwise, if this article in the Daily Mail is any indication. Popular science fiction of the early 20th century depicted Venus as some kind of wonderland of pleasantly warm temperatures, forests, swamps and even dinosaurs. In 1950, the Hayden Planetarium at the American Natural History Museum were soliciting reservations for the first space tourism mission, well before the modern era of Blue Origins, SpaceX and Virgin Galactic. All you had to do was supply your address and tick the box for your preferred destination, which included Venus. Today, Venus is unlikely to be a dream destination for aspiring space tourists. As revealed by numerous missions in the last few decades, rather than being a paradise, the planet is a hellish world of infernal temperatures, a corrosive toxic atmosphere and crushing pressures at the surface. Despite this, NASA is currently working on a conceptual manned mission to Venus, named the High Altitude Venus Operational Concept – (HAVOC). But how is such a mission even possible? Temperatures on the planet’s surface (about 460°C) are in fact hotter than Mercury, even though Venus is roughly double the distance from the sun. This is higher than the melting point of many metals including bismuth and lead, which may even fall as ‘snow’ onto the higher mountain peaks. The surface is a barren rocky landscape consisting of vast plains of basaltic rock dotted with volcanic features, and several continent-scale mountainous regions. It is also geologically young, having undergone catastrophic resurfacing events. Such extreme events are caused by the build up of heat below the surface, eventually causing it to melt, release heat and re-solidify. Certainly a scary prospect for any visitors. Luckily, the idea behind NASA’s new mission is not to land people on the inhospitable surface, but to use the dense atmosphere as a base for exploration. No actual date for a HAVOC type mission has been publicly announced yet. This mission is a long term plan and will rely on small test missions to be successful first. Such a mission is actually possible, right now, with current technology. The plan is to use airships which can stay aloft in the upper atmosphere for extended periods of time. As surprising as it may seem, the upper atmosphere of Venus is the most Earth-like location in the solar system. Between altitudes of 50km and 60km, the pressure and temperature can be compared to regions of the Earth’s lower atmosphere. The atmospheric pressure in the Venusian atmosphere at 55 km is about half that of the pressure at sea level on Earth. In fact you would be fine without a pressure suit, as this is roughly equivalent to the air pressure you would encounter at the summit of Mount Kilimanjaro. Nor would you need to insulate yourself as the temperature here ranges between 20°C and 30°C. The atmosphere above this altitude is also dense enough to protect astronauts from ionising radiation from space. The greatest disappointment of this space age in which we have learned so much about the planets is that not only is there no life on the other planets but they are all so hostile to life that manned exploration and colonization is going to be much more difficult than the science fiction writers of an earlier age could have imagines. Venus is not the swampy world with dinosaurs they imagined, but a literal inferno. Mars is not the home of an ancient civilization that may be planning to conquer Earth to rejuvenate their dying planet but a small, cold world with a very thin atmosphere. Even other solar systems do not offer much hope. Hot Jupiters seem to be the rule rather than the exception. It is safe to say that the Earth wouldn’t exist it there were a Jupiter in Mercury’s orbit. Nice Earthlike planets seem to be rather rare, though Earth sized planets are not easy to detect. Well, if it were easy, it wouldn’t worth doing and the fact that colonizing the other planets is more difficult than we might have thought only adds to the glory once we have done it. We really need to establish humanity on other planets. It is never a good idea to carry all one’s eggs in one basket. The sooner we can spread ourselves far and wide across the universe, the better the chances of the long term survival of the species. I think we ought to take the idea of a floating base for exploration a couple of steps further. 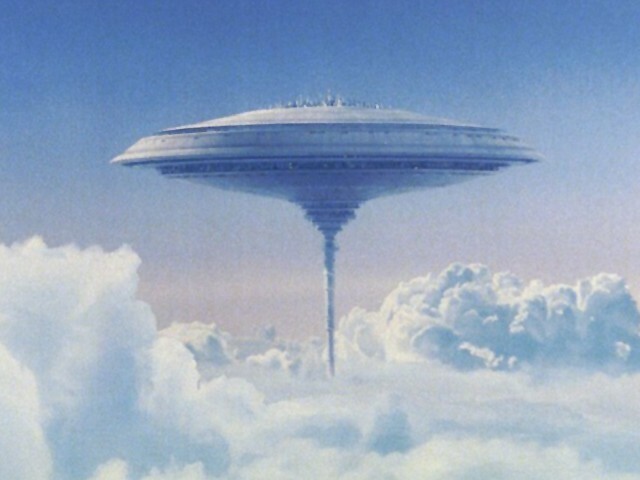 Why not floating cities in the atmosphere of Venus? I can imagine a time in which there will be thousands or even millions of people living and working among the clouds of Venus. Perhaps they will be working on terraforming Venus, lowering the planet’s temperature and altering its atmosphere to something breathable. Maybe someday Venus really will be a tropical paradise. In the meantime, living in the clouds will do. Personally, though, I’d rather live on Mars. This entry was posted on November 13, 2018 at 11:50 am and is filed under Science, Space. You can follow any responses to this entry through the RSS 2.0 feed. You can leave a response, or trackback from your own site.